A few year’s back MacLean‘s magazine published a cover titled, “Lawyers are Rats” that had the brotherhood of the bar up in arms and denying that the erosion of civil society occurred as a consequence of their handiwork. Recently, Chistopher Hume, of the Toronto Star, has directed his attention towards the conduct of developers who, among lawyers, share a special place in the imagination of a damning public. Toronto’s record of historical preservation is shoddy, spotty and replete with many missed opportunities. According to Hume, Toronto’s weak historical preservation laws are open to exploitation by inviting nefarious developers to behave like barbarians that broke through our gates. Sentiments build and are invested in spaces and buildings and this is what the buyer of a historical home or an authentic industrial loft sees as value. Destroying a house with that value for the sake of domino townhouses means, as a buyer, your new digs have a dirty secret – and in Toronto, the neighbours talk. John Todd, president of 1626829 Ontario Ltd (not a snappy corporate acronym meant to be remembered) has deliberately destroyed the historical features of Toronto’s 7 Austin Terrace – designed by John Lyle who is also responsible for Toronto’s Union Station and Royal Alexander Theatre. As the home’s current steward, to little surprise, John Todd seeks to demolish the historic house and throw up some townhouses. Apparently, destroying the architectural features of your home is enough to duck a historical designation in this city. According to Hume, the laws of civilization could not anticipate the actions of Barbarians. There is probably more stigma to living in a townhouse built on the ruins of an important historical structure than Hume accedes. Cultures and meanings people have of their built environments endure once the destruction is done. Sentiments build and are invested in spaces and buildings and this is what the buyer of a historical home or an authentic industrial loft sees as value. Destroying a house with that value for the sake of domino townhouses means, as a buyer, your new digs have a dirty secret – and in Toronto, the neighbours talk. Stepping foot inside a 120 year old Victorian in Toronto’s Rosedale or Annex neighbourhood with anticipation only to find MDF mouldings, prefinished flooring, ripped out walls and ubiquitous pot lighting is a bit like being witness to a crime scene. 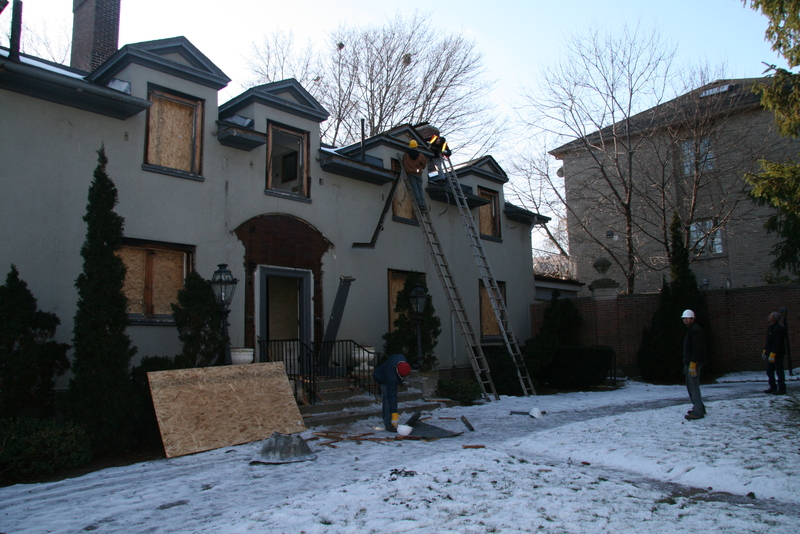 That being the case, most Rosedale and Forest Hill century home “renos” approximate barbarianism, if only the actions of the owners were more willful. Stepping foot inside a 120 year old Victorian in Toronto’s Rosedale or Annex neighbourhood with anticipation only to find MDF mouldings, prefinished flooring, ripped out walls and ubiquitous pot lighting is a bit like being witness to a crime scene. Toronto’s historic preservation laws have nothing to say about how one can best protect the interior features of a historic property. Newly gained professional salaries, an HGTV habit, precious little knowledge and big ideas combine to create interior designs that will soon be abandoned as a signifier of pop cultural capital. Perhaps, we are content with surfaces in this city, as the numerous “preserved” historic building facades would suggest. Eerie architectural artifacts lingering on a PoMo streetscape reminiscent of an old western sound stage or a New Urbanist “Main Street”. Though I suppose seeing at least some old brick in place is better than the alternatives.